It’s hard not to hear the goings on next door, especially given that my kitchen window looks out on my neighbor’s yard. At night I can hear swishing in the bushes as the night creatures make their way to Thea’s bowls. In the morning I hear more swishing and tap tap tapping and see the skunks and cats and crows and coyote that come to eat breakfast and dinner. When coyote does come around, it’s like a homecoming. Thea comes right into the lower yard where coyote’s lying in the grass not more than five feet away. She talks to him and coyote listens, waiting for her to put food into the bowl. Then she gives him her blessing and climbs back up the steps to go inside. Thea is unafraid because the coyote is her friend. He likes skunks. He likes to smell the breezes. He likes the tall grasses in Thea’s backyard. He must get sick of coyote life—enough of the urine smells and hard rocks for beds and howling at night. I know the neighbor shouldn’t be feeding wildlife… but this was delightful. I’m still chuckling. Thanks for replying Sutro Forest and thanks for introducing me to your remarkable website/blog. I had no idea! Thank you!! YES! 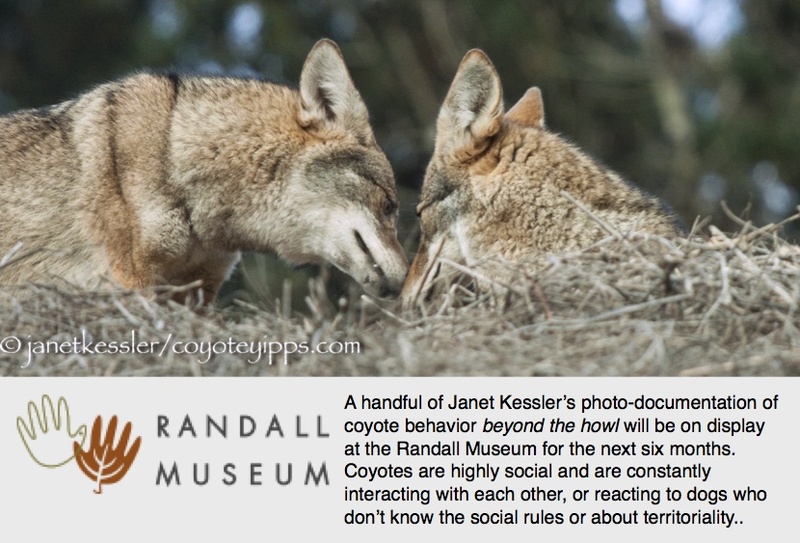 Early on in this blog I wrote about coyotes as having an aspect of “Ferdinand” the bull who just wants to sit in the meadow and smell the flowers! I have seen them many times sitting on a hill top, enjoying the sunshine and the scenery and dozing off now and again — and it has always brought to mind Ferdinand. Your “Peaceable Kingdom” is fabulous! I’m blown away by the skunks just wandering around right next to the coyote resting there! I’ve heard that most animals keep away from them except the owls who are not bothered by the smell. I have smelled several coyotes who have been “skunked”. However, I have also seen coyotes feeding on a skunk carcass in this area. Janet, once again thank you for letting me post on your great blog. I look forward to your post on smell; i did notice that when the skunk raised its tail the coyote looked its way, probably getting a whiff. Otherwise, the coyote seemed unconcerned, rather enjoying their company. He also seemed to defer to the skunks, letting them dine in front of him while he whiled away the afternoon. He could have gotten up at any time to interrupt their eating, but he didn’t. Truly a gentle soul. Go Ferdinand! !